Item #SC-CLDA-124: 14Kt. Yellow Gold Cuff Links with twenty-two Round Diamonds of .11 cts. pavé set in White Gold TW. 8.09 grams TW. Item #SC-TSDA-0028: Set of four 14Kt. Yellow Gold Shirt Studs with four channel set Round Diamonds of .08 cts. TW and White Gold accent. Item #SC-TSDA-2: Set of four 14Kt. Yellow Gold Shirt Studs with four Round Diamonds of .08 cts. TW bead set in White Gold. 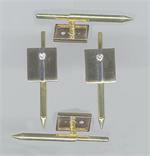 Item #SC-TSDA-176-X1: Set of four 14Kt. White Gold Shirt Studs with forty-two pavé set Round Diamonds of .28 cts. TW.